Moto3 and Moto2 – Argentina: Record tumble as Oilveira and Zarco secure pole in the dying seconds. With the sun finally with the paddock in Argentina the good weather lead to a highly competitive Moto3 session, before making the track slippery and wind appearing for the last class to take to the track, Moto2. Despite this both qualifying sessions shared similar qualities, with the track record dropping further and the closing seconds being crucial, and record altering. Moto3 got qualifying started and initially it was Danny Kent who looked to have control and a strong candidate to top the timesheets at the flag. His controlled and dominant performance for Leopard racing was halted by a last lap dash by Red Bull KTM rider Miguel Oilveira, giving the manufacturer their first pole this year. Kent’s time remained good enough for second, with Nico Antonelli completing the front row for Ongetta Rivacold. Efren Vazquez (Leopard Racing) took fourth after staying on his bike following contact which could have easily lead to a crash, Isaac Vinales (Husqvarna Factory Laglisse) early lap held on for fifth, with Karel Hanika having a return to form in sixth for Red Bull KTM. Jorge Navarro ( Estrella Galicia 0,0) was top rookie in seventh, his team-mate Fabio Quartararo could only manage 16th on his first tour around Rio Hondo. Romano Fenati (Sky Racing Team VR 46) made a late surge to push for eighth, one place ahead of another well performing rookie, Hiroki Ono for Leopard Racing. Enea Bastianini completed the top ten for Gresini. A tough day for John McPhee (Saxoprint RTG) ended in 19th on the grid. With all eyes on Sam Lowes after his Texas win, it was to be his big rival so far this season – Johann Zarco who had his eye on dominating in Argentina, powerful from the start and rarely challenged, the Ajo Motorsport rider ended a near perfect session by dropping the lap time one more time to seal pole with a new record on his final time around the track. 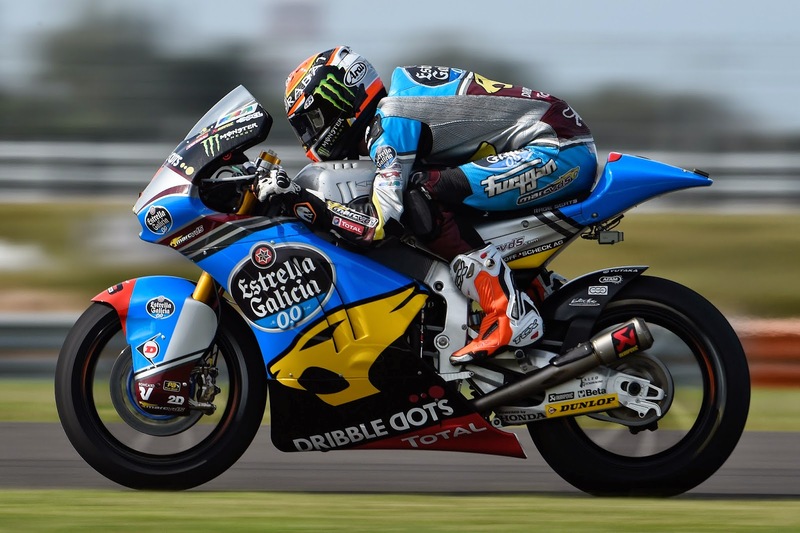 The Frenchman’s nearest rival was Tito Rabat, the EG 0,0 Marc VDS rider putting in more laps than any other rider as he aimed to fix the final sector, which was all that was keeping him from the top slot. Tom Luthi, on a Kalex for the first time this season, completed a lock out of the front row for the manufacturer as he gelled with his Interwetten bike to take third. Sam Lowes had good pace in practice but despite bike modifications at the midway point he could only manage fourth in a close Moto2 field. Joining the Speed Up rider on row two is Championship leader and top rookie Alex Rins (Paginas Amarillas HP 40) his old Moto3 adversary Alex Marquez starts 20th. Jonas Folger looked to be back in the frame of mind which saw him qualify well in Qatar and starts sixth. Simone Corsi (Athina Forward Racing) starts seventh, Sandro Cortese (Dynavolt Intact GP) eighth, Gresini’s Xavier Simeon ninth and Italtrans man Mika Kallio 10th. For full Moto3 results click here. For full Moto2 results click here. Next Next post: Moto3 and Moto2 Argentina – The great vanishing act: Kent and Zarco are streets ahead.